Central Auditory Processing Disorder (CAPD) is a condition that places those who suffer from it at a great disadvantage in many ways. It can be particularly difficult for children as they try to succeed academically. It creates many problems, particularly at school where the background noise and other distractions of a normal classroom are added. As a parent, you understand the frustration your child experiences at home, at school, and in social and play settings. You know that unless the problem improves, your child will fall further and further behind. The need to have directions to be repeated. Problems understanding in the presence of background noise. Spelling, reading, and other academic problems. Difficulty repeating sounds, letters, or numbers in sequence. A tendency to drop middle consonants or phonemes when learning to speak or write. Since many children with CAPD do not have a peripheral hearing problem, CAPD is beleived to be more of a brain processing/sensory integration problem than a hearing problem. Children affected by CAPD process information more slowly than it is received, therefore, they fail to process much that they hear creating perceptual gaps. They have difficulty understanding directions and frequently need directions repeated. This slow processing of information may be the result of slow reaction time and could be indicative of slow brain processing and a sensory integration disorder. 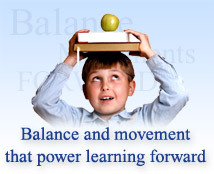 Children who suffer from CAPD may improve brain processing speed and sensory integration efficiency by engaging in balance exercises that have the effect of increasing neural involvement. The Learning Breakthrough Program uses balance as its central component to address brain processing difficulties. Central to the program is the Belgau Balance Board, which allows for balance therapy to be done at constantly increasing level of difficulty and the Pendulum Ball, which stimulates the development of brain timing processes. These activities have been reported to be very effective at improving the brain processes and overcoming the sensory integration difficulties that may be responsible for some of the problems associated with CAPD. In order to understand the link between balance and CAPD, it is necessary to understand the role that the vestibular system (balance sense) has on all brain processes. The Learning breakthrough Program has been reported to help students with CAPD process auditory information more efficiently and improve academic success.